Author Terry Golway has a new book out about Tammany Hall, the Irish-dominated political machine that ran the Democratic Party and NYC for the better part of a century. While he doesn't ignore the corruption, he focuses on the machine as a great provider of services, especially to the city's rapidly growing immigrant populations. Schools were central to Tammany's program. When I sat on the Panel For Educational Policy, the Chancellor would typically introduce the capital budget by claiming no mayor had done anything like Mike Bloomberg had to fund school construction. I would always correct them by reminding them of John Hylan, the Tammany pol and son of Irish immigrants. 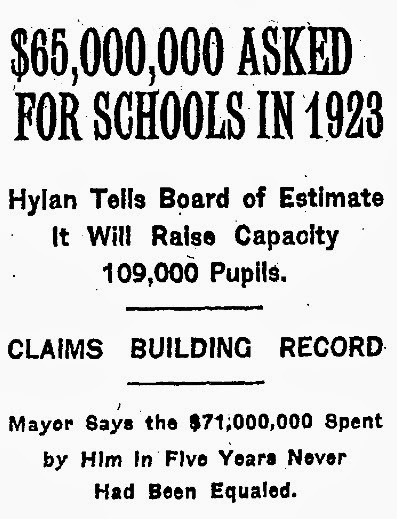 Hylan built 500,000 public school seats in the 1920s. Golway's book explains how Democratic reformers like FDR and Francis Perkins learned from the Irish political bosses the importance and mechanics of providing public services. The Democratic party would do well to refocus on services, especially public schools. Leaders like Governor Cuomo and even President Obama have instead chosen to champion charter schools controlled by wealthy financiers. We need a new generation of political leaders who will bring energy and focus to addressing the needs of our city. Here's an interview with Golway with highlights from his book. Headlines above are from NY Times archives on Dec 7th, 1922 here. Bless you, Patrick on this St Patrick's Day.